I spent last week in Chicago working in the newly constructed Children's Memorial Hospital. My part time role there over the last eighteen months has been one of architectural oversight for the wireless LAN design and deployment. The process has been a tenuous one because the building has been under construction from the onset of my participation and construction activities yield numerous barriers to any progress other than the construction itself. Add the union labor aspect of the construction and these barriers become exponentially multidimensional. The weather in Chicago dipped as low as -2 degrees wind chill factor. The wind always blows in Chicago. My hotel was only six blocks from the hospital, but the daily walk to and from was brutal and it was too short for a cab. When I showed up the first morning, the security guard took one look at me and said "you aren't from around here, are you". Bundled head to toe with a scarf over my face and winter gloves, I'm sure it was easy to spot the Texan in the pedestrian crowd. It sure made me appreciate Texas weather. My purpose this particular week in Chicago was to measure the wi-fi coverage throughout the facility. This required that I walk every foot of every floor with a tablet PC running special software to collect and analyze the signals. I'll spare you the uber-geek details and just say that it's a fairly complex, somewhat boring, and extremely time consuming process. I've performed this kind of work in hospitals throughout my civilian career. The cool thing about hospitals is they have interesting places that the general public never sees. In fact, most hospitals would rather the general public never even know these places exist. One of these places is the morgue. The morgue at Children's is new and pristine with the latest tools and furnishings offered for mortuary and forensic science. The creepy part of this morgue (as if a morgue by its very nature isn't creepy enough) is that all the implements are small; child size. I was struck my the recognition of the tiny dissection tables and grossing workstations with their little leg stirrups. I found it a sad necessity. Another eerie aspect of hospitals is the vivarium, which is the area where animal research is conducted. These areas generally have the same level of security as the psych ward because hospitals don't want the public anywhere near them. I did extensive work in the vivarium in the research department of a large hospital in Houston. I fully understand the need for animal research, but seeing the animals in their cages with wires and plugs attached to them is heartbreaking; especially the dogs. Dogs are fiercely loyal creatures and it pained me to see them and hear their groans. I suppose it's possible that given a dog's loyalty towards people, it might willingly give itself to research knowing that it was for the good of the humans to whom they are so devoted. Still, I'd sleep better at night knowing such research was performed on cats instead. But I digress. The highlight of my week in Chicago (other than getting to go home) was my dinner at Lawry's Prime Rib. I'm a major carnivore and probably eat way too much meat. However, all week I had eaten only salad and poultry, so a slab of prime rib was a well deserved treat. For those who have never been, Lawry's brings your meat to you in a huge stainless steel steamer cart and the carver slices it at your table. I hate eating out alone and would rather just skip dinner than be seen as some sad sack solo diner in a crowd of couples and groups. The entire meal at Lawry's is so consistently outstanding that I'll forgo my principals and just enjoy the food. 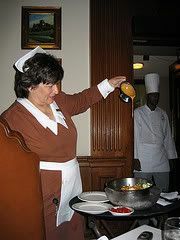 Still, I find it odd that the waitresses are referred to as "Ms. So-and-so" and they wear these old school poop brown maid uniforms complete with 1950's nursing hats. My flight home from Chicago was typical for any travel that involves O'Hare airport. All the flights were oversold and some were canceled due to bad weather, which only exacerbates the delays. Working in other cities away from my creature comforts always makes me appreciate getting to come home. Still, I find myself looking at the Alaskapalooza! 2013 countdown numerous times each day. I need a place to vent. Perhaps not every day; but every now and then. My head is constantly filled with crap and believe it or not, a few people actually find some of it interesting. As I was writing entries into my Alaskapade! 2011 blog, I found it almost therapeutic to dump my thoughts out there without concern for whether or not anyone actually read them. Apparently, plenty of people did. Some of the topics I wrote about were controversial and generated private comments chastising me for having the nerve to think such things, much less articulate them for the world to read. Like them or not, my comments and opinions were always honest, sometimes timely, and never sugar coated. This site will be a continuation of what I started in October, 2010 and will most likely contain random thoughts, opinions, and anecdotal stories of the mixed up crap that makes up my life. Read on if you like, but understand that while I feel everyone is entitled to my opinion, I reserve the right to completely ignore yours about the things I write here.